Imagine the life of a lock—when the home is built, that fierce little protector sits shining on the front door, barring entry to those who lack a key. It looks like it will last forever. But, over the years, weather and use will slowly take their toll. Each time the key gets pushed into the lock, thrown in a bag, or tossed on the counter, it may get a bit more dinged, adding up until the lock is hard to turn. Or, maybe, after one too many vigorous shoves at the door, the deadbolt may not quite sit right any more, making the door impossible to lock. When things like this happen, not only does that little lock stop functioning as it should, but those issues can compromise your home’s security, and that of your family inside. Of course, when your locks start sticking or fail to close, those can be signs that it’s time to replace your home’s locks. However, there are a few other instances that you should rekey your home as well. When any lock stops functioning properly, that’s a pretty good sign that you may need to call a locksmith. Occasionally, when it’s just a bit of dust or grime, blowing the lock clean with a can of compressed air is enough to clean out the lock and help it turn smoothly once more. However, if cleaning the lock doesn’t help, or the key won’t fit well in the lock, a locksmith is going to be your best bet for getting the lock working again. Locksmiths have the capability to remove the actual locking component from your door, after which they can clean and repair it or replace it without changing the hardware on your door. This is a quick and easy process, so you can get back to having smoothly functioning and protective locks without hours of hassle or huge expense. When you move into a new home, for the sake of security, we suggest you always have your locks rekeyed or replaced. Whether your home is brand new or has been there for decades, there is no good way of knowing how many keys were initially made, who was given one, if they were all collected (or not) before you moved in, and whether any additional copies were made. With an older home, the previous owners may have made a copy of the keys for a kid or grandkid as encouragement to just stop by, given a key to the weekly cleaning service, or made spares for other family or friends for whatever reason. Over years, unless the owner was particularly diligent, there isn’t a way to track every key to the home. Even for a brand new home, rekeying the locks can make a difference. Once locks are installed on the home, the builder will pass out keys to various contractors so they can do work throughout the home. Again, unless diligence was strictly maintained, workers who helped build your home may hold keys that would allow them easy access to your home. While it may seem like overkill to replace your locks entirely, rekeying the locks is a quick way to change the locks without altering the hardware, which means all those old keys floating around out there will stop working on your home, improving your home’s safety. Whether your lock doesn’t turn or you’ve just moved into a new home and you want to rekey the doors, it’s important for your outward facing doors to all have working locks to protect your home. 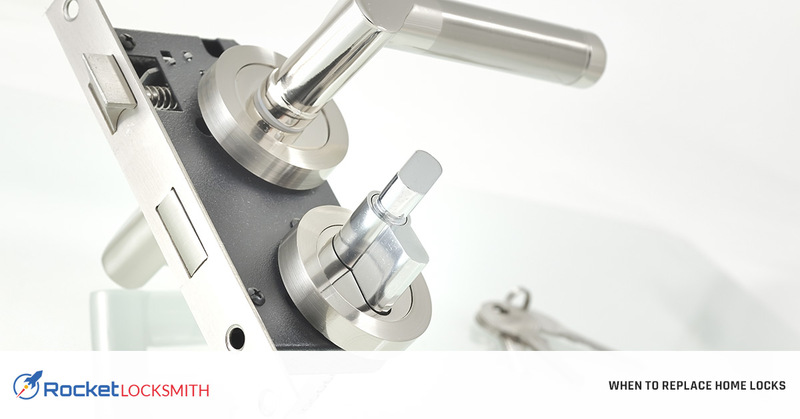 Call the locksmiths near you in St. Louis, Rocket Locksmith, for help getting your locks working again quickly. Contact us today to get started!